The HOPE 146 ministry is based on the principles found in Titus 2:3-5, which teaches how to grow and enhance our spiritual and personal lives, the lives of our families, and the lives of those around us. We now have two women's Bible study opportunities each month. We have opportunities for any women who desire one on one mentorship. We will also have opportunities for women to fellowship together. The study on the book of Philippians is designed to teach women of every age and season of life to glorify God no matter their circumstances. Learning to find joy in Christ in the midst of difficult times or difficult people. This study will meet in the Fellowship Hall on the second Tuesday evening of each month. No book is required for this study, however, a study guide will be available in the Book Nook at no charge. If you would like an additional resource, In Fulness of Joy by Susan Heck, can also be found in the Book Nook. Vercie McMullen will be teaching this study. The Excellent Wife Study will meet in Fellowship Hall on the third Tuesday of every month. This study is designed specifically for women who desire to have a better understanding of the biblical role of the wife. We recommend this study for young women who might be engaged, newly married, or women with small children. I would also encourage any woman who is going through difficulties in marriage to participate in this study. The excellent Wife book will be available in the Book Nook. Amanda Livingston will be teaching this study. Whether young or old, a woman has the potential to affect her world by her character and the conduct of her life. As believers, women should reflect and demonstrate that their help in every situation comes from the God of hope who brings joy and peace in believing (Romans 15:13). Please be sure to note the added Bible study and fellowship opportunities for the women of HOPE 146. 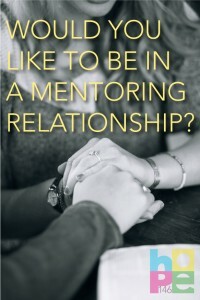 Are you also interested in a one-on-one, mentoring relationship? If so, please click here and complete the application. You’ll soon be prayerfully placed with another sister in Christ.